Phantom Termiticide / Insecticide 21oz. Phantom can be used indoors and outdoors it is a termiticide and insecticide that kills termites; ants; cockroaches; and bed bugs; through a powerful non-repellent active ingredient. Pests can not detect Phantom they walk right over it and then spread it to other insects hidden behind walls or in their home colony and it kills every other pest they come in contact with. 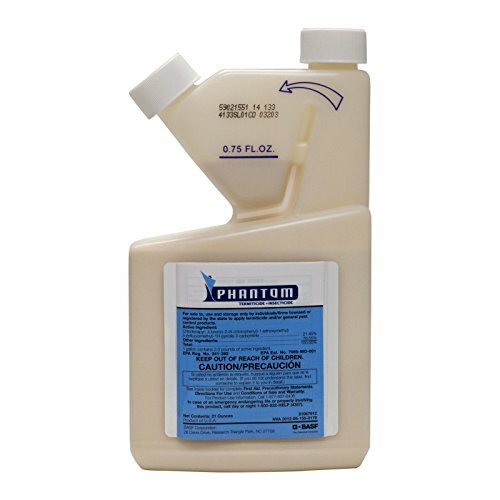 Phantom is virtually odorless; clear in color and provides superior pest control with a long-lasting residual. Once ingested; Phantom attacks pests from inside their own bodies by preventing their cells from generating energy. This leads to paralysis; and; ultimately; death. However; this process is not instantaneous; which means Phantom will not cause an accumulation of dead pests in a particular spot. Instead; they continue to behave normally and go about their regular routines for a short time before dying. There is nothing about their behavior to tip off others to Phantom's presence. Other products are far less stealthy; and; as a result; far less successful. For use - indoors (crack and crevice only) and outdoors around the perimeter. Application - 21 oz bottle makes 28 gallons of 1.25% solution for termites or 7 gallons (mix 3 fl oz. per gallon of water) for general pest control including bed bugs; roaches and ants.